The F450 is a well thought out 450mm quad frame built from quality materials. The main frame is glass fiber while the arms are constructed from ultra durable polyamide nylon. The F450 features integrated PCB connections for direct soldering of your ESCs. This eliminates the need for a power distribution board or messy multi-connectors keeping your electronics layout very tidy. Motor Mount Bolt Holes: 16/19mm. Built from quality glass fiber and polyamide nylon. Pre-threaded brass sleeves for all of the frame bolts. Colored arms for orientation to keep you flying in the right direction. Large mounting tabs on main frame bottom plate for easy camera mounting. This frame is used in quad copter. 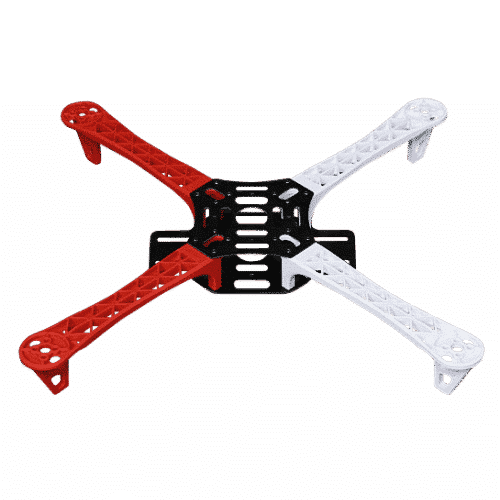 Also Searched as : quadcopter frame india, quadcopter frame price in india, quadcopter frame buy, quadcopter frame buy online, , buy quadcopter frame, quadcopter frame kit, quadcopter frame kit india.